1959 McCall's #5302 vintage sewing pattern, misses' blouse, slim skirt and reversible jacket or coat, size 10. Slim three-gore skirt, long sleeve tuck-in blouse, and straight hanging, reversible, cardigan jacket or coat. Blouse has front neck opening, Peter Pan collar, set-in sleeves gathered into link buttoned bands. Dart fitted skirt has low kick pleat at back. Blouse and skirt have left side zipper closings. 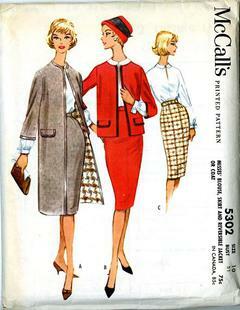 Jacket or coat has three-quarter set-in sleeves, fake pocket flaps.